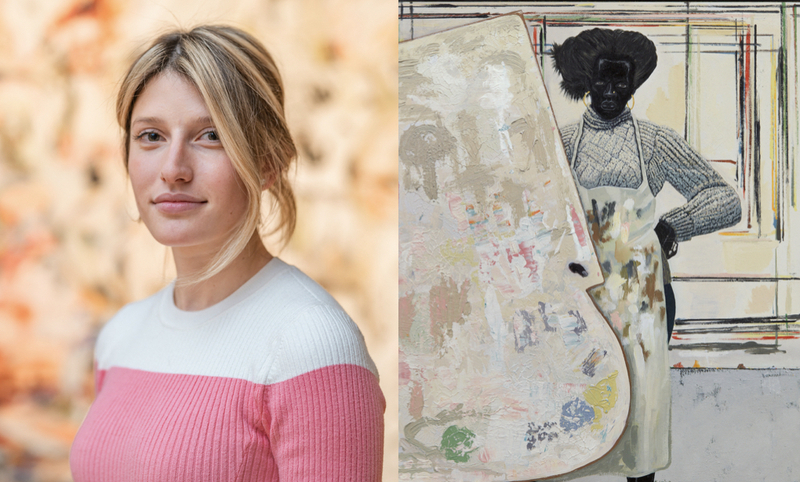 Charlotte Van Dercook, left; Kerry James Marshall’s Untitled (Painter), right. With the Mid-Season Contemporary sales upon us, we caught up with Charlotte Van Dercook, Head of Sotheby’s Contemporary Curated Department in New York, to ask a few questions about how the middle market in Contemporary art is shaping up. AMM: You’ve been working on expanding and integrating the mid-season sales, now called Contemporary Curated, and the Contemporary Day sales during the major auction cycles. Could you give a sense of how those sales have grown over the past 3-5 years? CVD: We’re thrilled with the growth of the Contemporary Curated sale over the past few years. Two of our three highest-ever totals were achieved in the past 2 seasons and we are well positioned to have another top sale this season, and, looking back, it’s exciting to see how much the sale has grown in just a short period of time. The middle market, with works ranging from around $50,000 to $3 million, is experiencing some great momentum at the moment, which can be attributed in part to the pool of collectors who are actively looking for works within this more accessible price band. I think collectors are looking for the next modern masters, similar to how collectors in the 80s and 90s sought the up-and-coming greats of their day. Artworks by those who were working at the height of their career in the 80s, such as Basquiat, have now appreciated so much in value that I think collectors are now looking to discover emerging artists who have the potential to reach the same heights. In addition, for high net worth individuals, acquiring works from our sale is relatively low risk. The Contemporary Art Online sales are also a great complement to our bi-annual offerings in the Curated auction. The wide range of accessible price points allows us to reach new audiences while considering which platform, live or online-only, is the best venue to present works on behalf of our clients. AMM: The mid-season sales were once a venue for trading minor artists who didn’t get sold during the main auction cycles. Now the mid-season sales have become a venue where artists with developing markets get more attention amid less out-right competition. Could you give us some examples of the artists whose markets have emerged in these sales? CVD: Sam Gilliam is a great example of an artist whose market has grown in the past few years. We’ve established numerous new auction records for Gilliam, starting in 2017, which is a combination of the quality of the works themselves and it being the “right” moment to bring his pieces to market. Gilliam has had several museum retrospectives recently, which have occurred in the midst of this larger moment where collectors, galleries and museums are rediscovering artists who have historically been overlooked. Mark Bradford is another artist whose market has experienced growth in our sales. His incredible work, Curtis, was featured on the cover of our catalogue in September 2013 and it set a new auction record for the artist after it sold for $2.3 million against a high estimate for $700,000. While in our Contemporary Evening sales, we see new artist records that are set at the very top of the market, we see that same excitement and competition in our sales but at a lower price band. This doesn’t make the works any less important or any less in demand than those presented in our marquee evening sales. The rarity and quality of the works are what drive these record-setting prices. Amy Sillman and Anne Truitt are two other artists whose markets we’ve seen expand in recent years through our sales. AMM: Speaking of Sam Gilliam, can you give us a sense of how that price and sales progression happens? Do you cultivate buyers and sellers or respond to sales results? CVD: It’s a combination of things – explaining the potential upside, the research that goes into our extensive cataloguing as well as placing the work prominently within the sale. It’s all about selecting the best platform through which the work or works can shine, and the Curated sale is a great option for many of them. AMM: Once an artist’s market develops beyond Contemporary Curated, what happens next? Do you continue to find work appropriate to your sales’ price level or look for the next artist. CVD: We try to find works that suit the sale—whether they’re by new or emerging artists, or pieces by artists that are regularly offered in our other Contemporary sales. For instance, Noah Davis is making his first appearance at auction in our Curated sale this season, but we also have a masterwork by Jack Whitten called Special Checking from 1974. All the other works in the 1974 Whitney solo exhibition for the artist are in museum collections. In our November 2018 Contemporary Art Evening Auction, Sotheby’s established a new auction record for the artist. In addition, it’s a privilege to offer another phenomenal work by Kerry James Marshall, Untitled (Painter). This is a great example of a work that could’ve been added to any sale, but the Curated sale this season was the best venue. AMM: Can you name a few artists whose markets are beginning to develop? CVD: Overall, I think we’re seeing the paradigm shift for women artists and artists of color, as more collectors are looking to fill voids in art history by acquiring works by these artists for their collections, it’s exciting to see these works get, in some cases, long overdue market attention. Some of these artists whose markets are still developing that are included in this season’s sale are Alice Neel, Faith Ringgold, Eva Hesse, Jack Whitten, Henry Taylor, Robert Colescott, Lynda Benglis, Loie Hollowell and Lorna Simpson. This has to do with a lot of factors that include strong gallery and instructional support but some of the artists mentioned above have been working since the 40s. AMM: In the next few weeks, we have a mid-season sales pegged to the ADAA Art Show and Armory show in New York followed a week later by Contemporary Day sales in London. Are those sales conceived and run separately without regard to the contents and bidders? Or do you coordinate with your colleagues in London? If so, what are the surprising overlaps between the two sales? CVD: We do consider the global audience of potential buyers when putting together our sales, and I also stay in close contact with my international colleagues about key works that have been consigned to their sales. Along with the input of my New York colleagues, we’re able to determine which sale is best suited for a particular work to realize its full potential on the market. The growth of online and mobile bidding has also made collaborating with our global Contemporary departments an even bigger priority for us. Naturally, with the sheer number of consignors in each region, some overlap in the sales’ contents will occur. For instance, there are works by Louise Bourgeois and Toyin Ojih Odutola in the New York Contemporary Curated sale and in our Contemporary Art Evening Auction in London next week. Pieces by Cecily Brown and Sean Scully appear across the Evening, Day and Curated sales as well. Gerhard Richter’s Düsenjäger (1963) is back on the market after a brief dalliance with an over-confident Chinese guarantor. The work was sold by collector Paul Allen in November of 2016 to Zhang Chang who had provide a third-party guarantee at $24m. Zhang would not or could not pay for work. Now Phillips is bringing the major work in Richter’s oeuvre back to market with an estimate £10-15m, almost the same estimate it carried nearly a dozen years ago when it sold to Allen in November 2007. The work comes to market amid rumblings within the art market that the third-party guarantee system has gotten over-extended in both the number of works that it covers and the number of buyers that participate. Questions remain—that will only be answered in sales to come this year—whether there are more dis-illusioned guarantors out there burned by the failure of works to find buyers. Are these guarantors sufficiently put off to retreat from the guarantee market? In the meantime, Phillips has more than one noted German artist in their London sale. Martin Kippenberger’s Ohne Titel (Meine lügen sind ehrliche) (1992) (£3.5-4.5m) leads the sale along with another self-portrait the artist. In between the Kippenberger and the Richter is an example of Roy Lichtenstein’s enamel, Girl in Mirror (1964) with an estimate of £4.5-6.5m. The Lichtenstein enamel is an editioned work with eight examples and two artist’s proofs. The Lichtenstein is guaranteed by Phillips. The example on offer was bought at the sale of Max Palevsky’s at Christie’s in 2010 where the buyer paid $4.89m. Four years later, another example of the work was sold at Christie’s for $6.885m. Over at Sotheby’s, the work has had its day in the sun too. One sold in 2007 for $4m in New York. Another sold in London in 2012 for nearly £2.4m. Seeing the reduced number of lots sold over the last three years comes as no surprise. But it does confirm the significant shift in the Contemporary art market from the trophy market that dominated the years 2010-2015. The consistent number of lots sold during the 2010-15 period and the 2016-18 period did not yield a consistent dollar volume. In the chart below, we can see the rising value of the Evening sale lots sold. After nearly twenty years in the auction world and a decade with Christie’s, Francis Outred, Chairman, Head of Post-War and Contemporary Art, EMERI, has decided to leave the company. Francis joined Christie’s in January 2009 to oversee the management, strategy and vision of the Post-War and Contemporary Art team in Europe. In July 2014, he was promoted to Chairman and Head of the department in EMERI, following a period of unprecedented development, growth and success. During his career, Francis has overseen five of the six highest grossing auctions ever to take place in his field in Europe. Known for his innovative approach to catalogues and exhibitions, under his guidance the team have significantly expanded the remit of the department, extending their activities in private sales, digital engagement and other innovative projects. These have included special one-off exhibitions such as House of Cards at Waddesdon Manor and the first exhibition of Peter Doig in China, at Faurschou Foundation, Beijing alongside the launch of the gallery, Christies Mayfair, and landmark cross category exhibitions there such as Reflections on the Self and About the Line. Francis was also responsible for the consignment of the most expensive work of art ever sold in his field, Francis Bacon’s Three Studies of Lucian Freud which achieved $142.4 million at Christie’s New York in November 2013. He has also twice been instrumental in achieving the record for any photographic work of art at auction, both times by Andreas Gursky as well as other records for contemporary artists including Damien Hirst, Jeff Koons, Gerhard Richter, Lucio Fontana, Yves Klein and Peter Doig.